A series of bomb and gun attacks left well over a hundred people dead and dozens more injured in central Paris on Friday night. Some reports put the number of dead at 158. There were at least seven attacks, all in the east and north of the city. In one venue alone – the Bataclan concert venue – over a hundred people were killed. 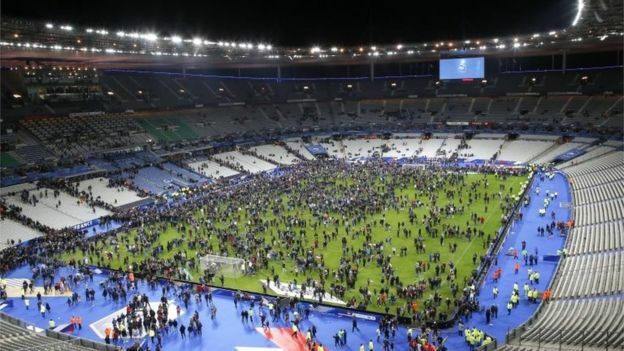 A heavy metal band were in the middle of a concert when gunmen opened fire and threw grenades into the crowd. Witnesses say the firing lasted for at least fifteen minutes. The attackers were apparently bent on killing as many people as possible, leaving the security forces no choice but to storm the building before more people were killed. Given the nature of the concert it is likely that most of the victims in the audience would have been young people. 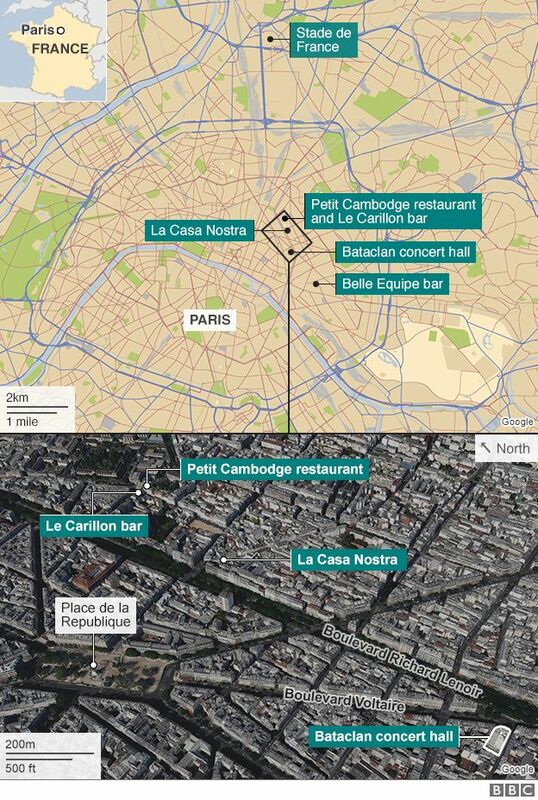 As well as the Bataclan the attack sites included the restaurants Le Carillon, La Belle Equipe, Le Petit Cambodge, and a fast food restaurant near the national football stadium. There were reports of gunfire at another site as yet unidentified. The clearly shocked French President Francois Hollande described the attacks as ‘unprecedented’ and called on the country to stay strong in the face of fear. He said France will be victorious. Earlier the president had been watching his country play football against Germany in the Stade de France. It was near there that the first of the suicide bombers struck at a fast food restaurant close by. The game was abandoned and he left for the Interior Ministry. Spectators were kept in the stadium for some time to stop them spilling on to the streets. With about an hour a series of other attacks had taken place including the assault on the Bataclan concert hall. A restaurant was attacked in the 11th district by a suicide bomber. Reports say eleven people were killed there. The city was immediately locked down. All security force leave was cancelled and 1500 hundred soldiers were mobilised to help bring the situation under control. 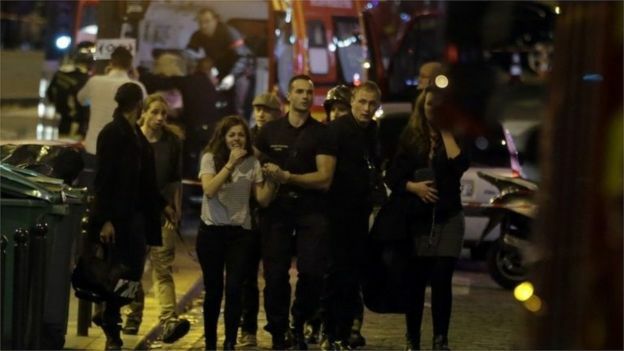 By 5am CET police were saying eight attackers had been killed but that accomplices could still be at large. Hollande ordered all France’s borders be closed. Paris came under effective curfew for the first time since 1944. Hospitals were overwhelmed as fleets of ambulances ferried the dead and injured to them throughout the night. Early on Saturday morning it was still unclear if all the gunmen had been captured or killed. President Obama was quick to voice his condolences to France and to offer all the help the US can give to pursue those responsible for what he called an attack on humanity. There are reports that some of the attackers shouted that their actions were a response to France’s actions in Syria. There was no immediate verifiable claim of responsibility but supporters of the Islamic State militant group which controls swathes of Iraq and Syria said in Twitter messages that the group carried them out. The attacks came within days of attacks claimed by Islamic State militants on a Shi’ite Muslim district of southern Beirut in Lebanon, and a Russian tourist aircraft which crashed in Egypt’s Sinai Peninsula. France has been on high alert ever since Islamist gunmen attacked the satirical weekly Charlie Hebdo and a Kosher supermarket in Paris in January, killing 18 people.